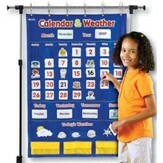 Everyone in class will be able to keep track of what day it is, and when holidays are approaching, with this blue calendar pocket chart. 46 clear pockets provide room for the included season, month, year, days of the week, days, weather, and special-events cards. Storage pockets at the bottom keep cards not in use safe. Cards are written in English on one side and Spanish on the other; special day cards are dry erase. Measures 38.25" x 25.5". Grommets at the top allow for secure hanging. 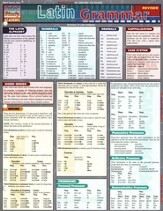 I'm the author/artist and I want to review Bilingual (English/Spanish) Calendar Pocket Chart.